Horse Racing Pictures: "The Sport of Kings"
Here you can see some horse racing pictures and learn a bit more about the sport. 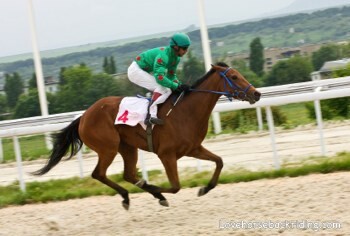 Horse racing is probably the most well known equestrian sport today. It dates back to Egyptian times and was also very popular in Roman times. One of the reasons it is so popular is because of the betting or gambling associated with the sport. 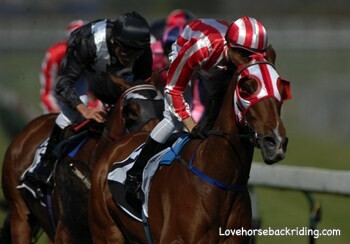 These pictures are of flat horse racing. The horses run on an oval track with dirt or turf footing, and there is no jumping. Common breeds used in flat racing are the Thoroughbred and American Quarter Horse. The rider or jockey rides standing up with very short stirrups to keep as much weight as possible off the horse's back. The racing saddle is a very light scaled back version of an english saddle. There is hardly anything to it by regular horseback riding standards. At the beginning of each race the mount and jockey enter the starting gate or starting box like you see above in this and many other similar pictures. It is a very narrow box. Injuries can happen here if the animal is not comfortable being confined. The closer the team is to the inside of the track, the more of an advantage it is seen to be because of the shorter distance. Horse racing uses very young horses. In fact, they are so young their racing career is over by the age of 5 or 6 years old. That is the age when most other horses are just getting started in a discipline. The average lifespan of a horse is 25+ years. Race horses are started and raced by the age of two. They are forced to perform before their body is physically ready for so much stress and strain. Injury is very common. This often ends the horse's usefulness and possibility of a second career and sometimes his life. Racing is a "throwaway" industry. 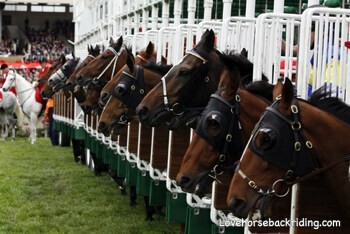 Tens of thousands of race horses are bred each year. For every one you see at the big races thousands more like in these pictures end up in slaughterhouses because they weren't fast enough, have injuries, or are unable to be re-trained. There are organizations that exist for the purpose of re-training and re-homing those animals with racing backgrounds such as ReRun, but unfortunately they cannot possibly save them all. This is due to limited resources and the sheer volume of horses bred. If possible, consider adopting your next mount. You can save a life. Even if a horse is successful at racing, it doesn't guarantee them a secure future. This was the case with Ferdinand, an American contender and Kentucky Derby Winner who after his successful career was sold into Japan for what later became an unsuccessful breeding career and was later slaughtered into dog food. That doesn't seem too great of a deal for the horses in these pictures and others involved in the "Sport of Kings," does it? While it is fun to see horse racing pictures and watch it on TV, it loses that "noble" distinction when the animals that give their all become "used up" as babies and are not bred responsibly enough to be cared for throughout their lives.